Nashville, Tenn. (May 27, 2018) - Multi-platinum selling band MercyMe took top honors at the 2018 K-LOVE Fan Awards, garnering a win in all nominated categories - Film Impact (for the box office smash I Can Only Imagine), Group or Duo of the Year, Song of the Year for "Even If" and Artist of the Year. Cory Asbury's captivating hit "Reckless Love" also won big, honored for both Worship Song of the Year and Breakout Single. A full recap of Sunday night's winners is listed below. 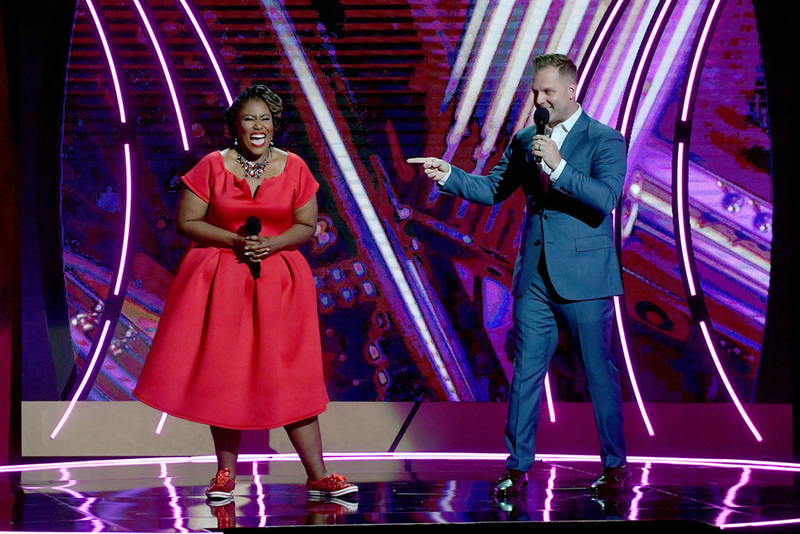 GRAMMY® acclaimed artists Matthew West and Mandisa teamed up to host the sixth annual K-LOVE Fan Awards at Nashville's iconic Grand Ole Opry. The evening included performances from some of the biggest names in Christian music including Casting Crowns, Chris Tomlin, Cory Asbury featuring Francesca Battestelli, for KING & COUNTRY, Hillsong Worship, Jordan Feliz, Mandisa, Matt Maher, MercyMe featuring Trace Adkins, Newsboys United, Tauren Wells featuring Natalie Grant, TobyMac, We are Messengers featuring Social Club Misfits, Zach Williams and Matthew West, whose performance was a moving tribute to the late Rev. Billy Graham. Dennis Quaid, a lead actor in the winning film I Can Only Imagine, surprised fans with a moving performance. Other notables included John Crist, Jasmine Murray, Micah Tyler and Riley Clemmons who were among the additions to the fan-fueled awards show. Danny Gokey, Elisabeth Hasselbeck, Mike Donehey of Tenth Avenue North, Mike Weaver, Natalie Grant, Plumb and Sadie Robertson were among those presenting the honors for the night. Marking a touching point in the evening, Mandisa & West surprised a teen who had just undergone a heart transplant after a 15 year journey of facing heart complications with a special K-LOVE Fan Award. John Corbell and his family would listen to K-LOVE during his time at Monroe Carell Jr. Children's Hospital at Vanderbilt. His family was among the special guests of the night from Ryan Seacrest Foundation's Seacrest Studios at Monroe Carell Jr. Children's Hospital at Vanderbilt. A new partnership with TBN will allow fans from all over the world to tune in to the 2018 K-LOVE Fan Awards. Marking the show’s first appearance on television, TBN will broadcast the 2018 K-LOVE Fan Awards on Thursday, May 31 at 8 p.m. ET to its audience of more than 100 million households, with most markets experiencing the show in HD. Viewers can find their local TBN channel through the network’s Channel Finder at: https://www.tbn.org/watch/channel-finder. Coca-Cola Consolidated again sponsored the fan-fueled awards show, marking the third consecutive year for the partnership. Fans came from all over the country to Nashville to participate in the K-LOVE Fan Awards weekend which included concerts, a songwriters showcase, the annual Run For Love 5K, artist autograph signings and more. Nashville, Tenn. (Apr. 3, 2018) – “Reckless Love” from Cory Asbury has quickly climbed atop the Mediabase Christian Audience Chart as one of the fastest growing songs taking the top spot in only seven weeks. The single, which is found on his chart-topping album bearing the same name, marks Asbury’s first No. 1 at radio. “Reckless Love” also topped Billboard’s Hot Christian Songs Chart and is currently No. 2 on the Christian Airplay Chart. Asbury will join other members of the Bethel Music collective for select dates of April’s Outcry Tour uniting with Elevation Worship, Mosaic MSC, Vertical Worship and Christine Caine. Outcry Tour will visit Oklahoma City, Houston, Detroit, Orlando, Atlanta, Nashville and more. To experience Bethel Music on tour, stay tuned to Bethel Music Online. Asbury joined Bethel Music three years ago and was featured on the collective’s Have it All album. His previous solo releases include worship anthems such as “Where I Belong,” “So Good to Me,” “Always Faithful” and “Jesus, Let Me See Your Eyes.” In January of 2018, Asbury released Reckless Love which topped the Billboard Top Christian Albums Chart. The title track also hit No. 1 on Billboard’s Hot Christian Songs Chart and the Mediabase Christian Audience Chart, while continuing to make an impact at radio. Asbury serves as the Worship Pastor at the Radiant Church in Michigan where he and his wife Anna have a family of three.